You are currently browsing the Carpe DMM blog archives for April, 2014. We got up slowly this morning, had breakfast, and then headed out around 09:00. We walked down Post Street and then crossed Market to 2nd Street, which we walked south along until we reached AT&T Park, the home field of the San Francisco Giants baseball team. We had tickets for the 10:30 guided tour. 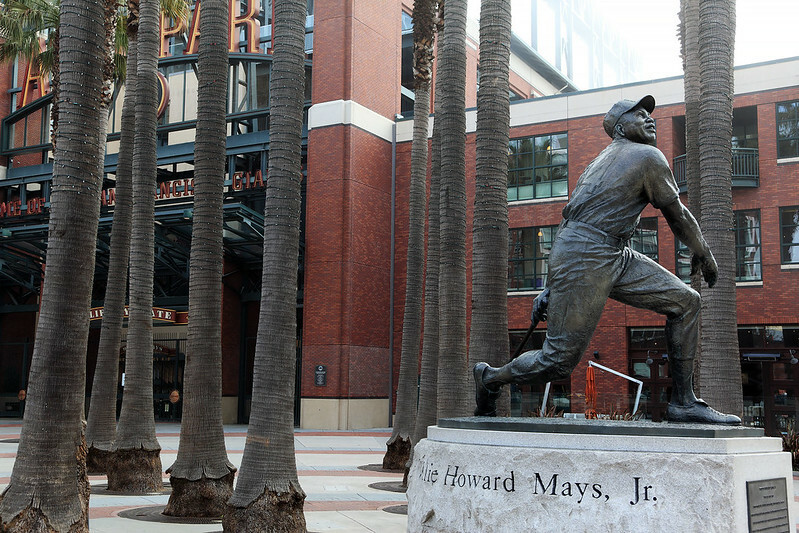 Willie Mays Plaza, outside AT&T Park. We arrived quite early, so walked around the park clockwise, seeing McCovey Cove and various other things around the perimeter. The weather was dry, but a low fog hung around, making it impossible to see across the bay. We reached the large Giants Dugout store on the west side of the park and confirmed this was where our tour would start, than continued our circuit a little to see Willie Mays Plaza at the largest entrance to the park. Then we returned to the store to wait for the tour to begin. There were about twenty people on the tour. An older man introduced himself as Emmett and led us on the tour. Unfortunately there was a big Valentine’s Day charity event being hosted in a huge marquee on the playing field, so we weren’t allowed on to the field at all, but the tour took us through the visiting team changing rooms, the practice batting cages, the press media room, and out into the stands at the highest, or “view”, level, from where we had a great view of the entire field. In the visitor changing room was an old door from Candlestick Park, which was signed by every player for the Giants and every visiting team during the entire last season the Giants played at Candlestick. Emmett said the Baseball Hall of Fame Museum in Cooperstown wanted the door, but the signing was the idea of the manager of the visiting team rooms and when he started he offered to buy the door for the cost of a replacement – $80 – and the Giants management accepted, so the signed door was his personal property, and he wanted it displayed in the Giants visitor rooms. We also got to walk through the memorabilia museum section, which premium game attendees have access to. 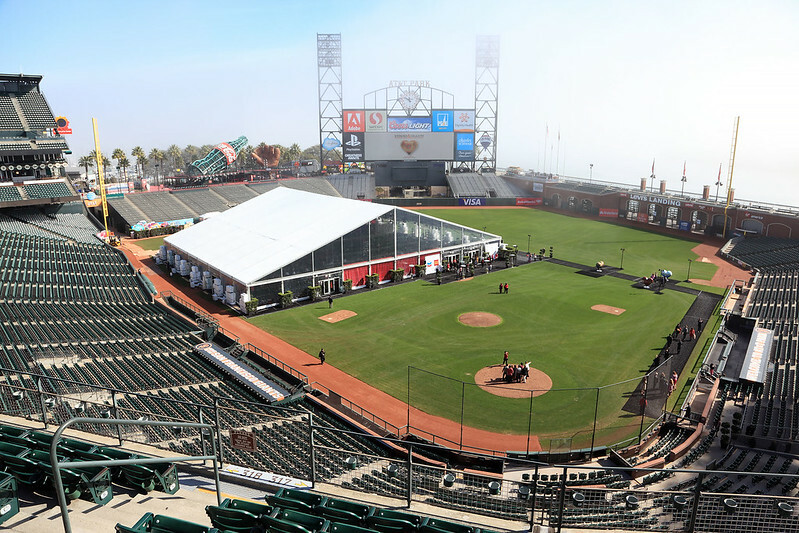 It contained lots of game gear, signed baseballs, shirts, and so on, as well as the two World Series Championship trophies which the Giants won in 2010 and 2012. The tour concluded just after 12:00. We exited the park and walked back over to 2nd Street to walk back up towards a place we’d passed earlier on our way to the park: The American Grilled Cheese Kitchen. We went in to get some lunch and joined a queue of a dozen or so people waiting to order. It was clearly popular. M. got a Mousetrap, which was the simplest sandwich they had, with four different types of cheese on it. I got a Mushroom and Gruyere, which I think only had two different types of cheese. We also ordered a bowl of spicy tomato soup, which came with a small paper bag of croutons. All of the food was really good, and the sandwiches both came with a small apple, which we also ate after finishing off the sandwiches. From there we walked back towards Market Street, cutting west at Mission to head towards the Target store there to get a clipboard to protect the comic artwork Shaenon had given me. On the way we actually ran across a stationery shop, so went in. We asked where the clipboards were, but found they were all a different style to the ones we have at home; they were just a single hard board with a clip at the top, and didn’t have the folding front cover that would give all around protection. We looked around a bit more and I found a hadn’t plastic shell case with a clip on the front designed to protect documents. It was a bit pricey at $16, but I wanted something strong so I bought it. 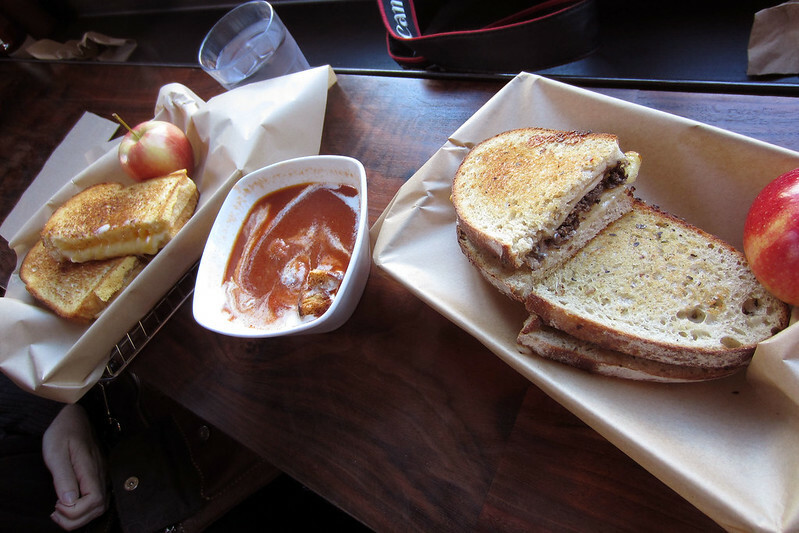 Lunch at the American Grilled Cheese Kitchen. The next stop was the Ghirardelli shop on the corner of Market St and New Montgomery, which we happened to pass right by not longer after M. said she might have to get some Ghirardelli chocolate at the airport as a gift for my mother. We picked a selection of chocolate squares and had them wrapped with a ribbon. We returned to our hotel by about 13:30 and relaxed for a bit before having showers and packing our luggage. We checked out just before 16:00, then sat in the lobby for a little while as M. had a cup of water from the dispenser there. We decided to head straight to the airport and wait there, even though our flight check in won’t be for a couple of hours yet, as there wasn’t much else we could do. We’ve just had a walk through the airport check in area, looking at the SFMOMA shop for a bit, then sitting in a food court to while away a bit more time until we can check in. I got an apple to tide me over until dinner on the airside of security. We headed to the United counters to check in about 3.5 hours before our flight. The queue we joined was mostly Japanese people, evidently for an earlier flight to Japan. However, after waiting for about fifteen minutes, nobody had advanced in the queue at all, and all of the people at the counters were still there talking to the check in staff. We realised something was wrong. Fortunately, an airline staff member came by and said that this queue was for people whose flight to Tokyo had been cancelled, and all passengers checking in for Australia should move to another set of counters. Once we’d done this, we were in a queue which actually moved and checked in a few minutes later. Last sunset in San Francisco. We had our exit row seats again. The man in the row of three with us was a geophysicist who specialised in geothermal energy. He was travelling to New Zealand via Sydney for a conference there. The flight passed uneventfully and we landed a little bit early on a warm and steamy, rainy Sydney morning. Saturday morning, as we’d skipped Friday by crossing the international date line. The taxi driver who took us home said the weather had been fine until the rain started that morning. I guess we brought it back from San Francisco with us. We allowed ourselves a small sleep in this morning, getting up at 08:00. After breakfast we left to catch a 38 bus all the way west to Land’s End, where the city meets the Pacific Ocean. We got off at the terminus on 48th Avenue, just a short walk from the Cliff House and Sutro Baths. We walked down to the baths and then out to a lookout point facing Seal Rocks. There was a lone angler down by the water throwing a line into the churning swell, and on the lookout point were two men with spotting telescopes on tripods. We struck up a conversation with them; they were out here to watch birds. They pointed out some oystercatchers, which I got a long range photo of, and mentioned a few other birds they saw out there occasionally. At one point we saw a whale surface to breathe, quite close to the shore. The men said it was a grey whale. We watched the streams of bubbles it left on the surface for a while, but didn’t see it surface again. After a few minutes enjoying the view and the brisk morning air, we walked up the hill and around the path to the north, to another lookout where we had a views of the Golden Gate Bridge. 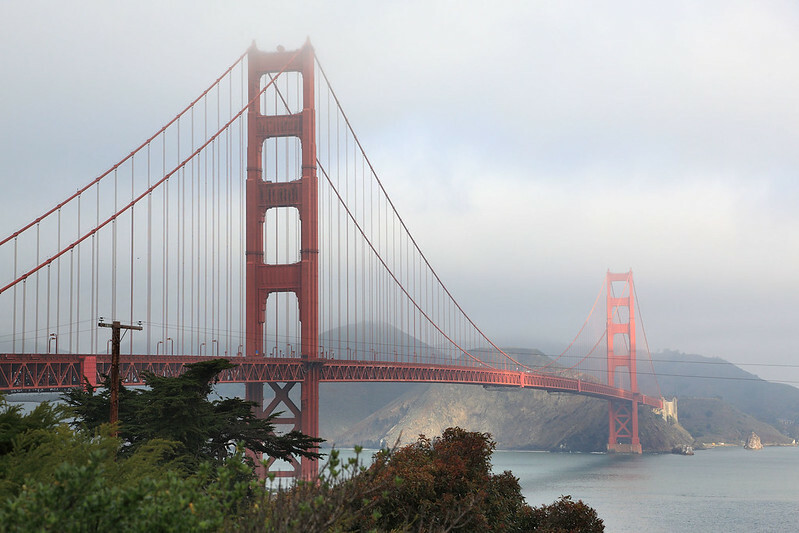 The weather was overcast and grey, but the cloud was just high enough to let us see the bridge, with just the very tops of the towers occasionally disappearing into the fog. We walked up the hill from there to the U.S.S. San Francisco memorial, which overlooked the ocean, then on to the same bust terminus where we’d arrived. One bus was just leaving as we approached, so we had to wait ten minutes for the next one. The bus took us back east to the intersection with Divisadero Street, where we caught a 24 bus south. 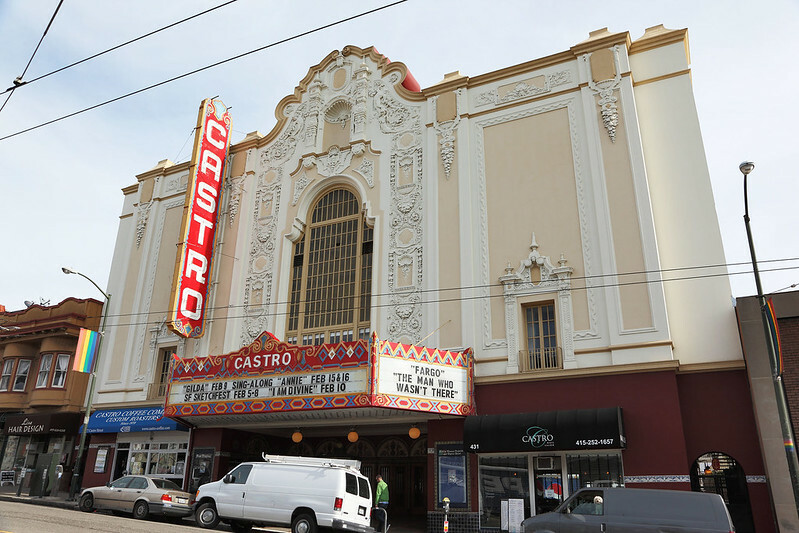 This took us into the Castro district, the heart of the gay and lesbian community in San Francisco. It was fairly obvious from the street decorations and some of the businesses. We stopped in at a cafe for a late morning snack. M. had Moroccan mint tea and I decided to get a bowl of chick pea soup. The soup was thick and peppery and came with some hot Irish soda bread, all of which was very good. M. shared a bit of the bread and soup too and agreed. Following that we walked down Castro Street and one of the side streets to have a look at the various shops and other things. There was a place called Posh Bagels, where we stopped to buy some for a light lunch after the soup. They had an interesting selection and we got a dried tomato bagel with cream cheese and a pesto bagel without. We ate them as we walked across from Castro to Valencia Street, heading towards the Mission district again, but this time to walk down Valencia rather than the parallel Mission, as a man who was running a shop in Sausalito had told us that this was a more interesting street to look at. It had many interesting shops and galleries, and we stopped in several to have a closer look. 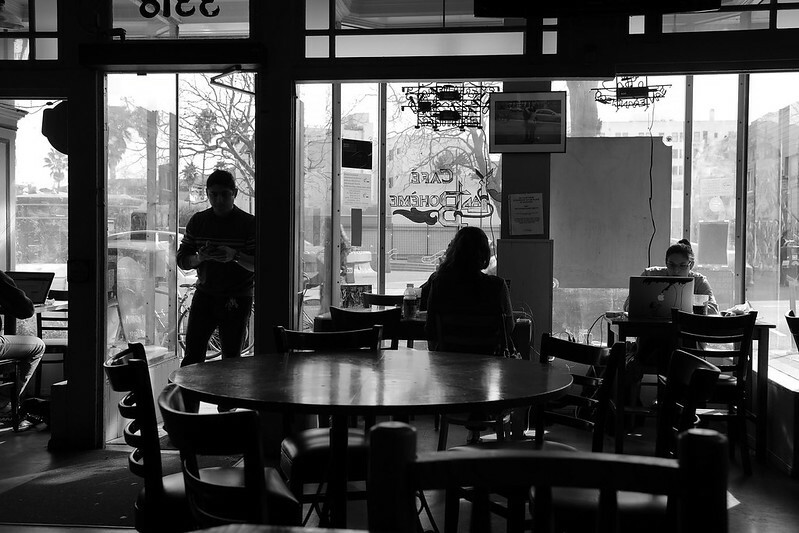 Cafe La Boheme, The Mission. When we reached 24th Street, we crossed the block over to Mission, intending to catch BART back to our hotel. But we stopped in Cafe La Boheme so M. could get a coffee and we sat in there for a while with all of the other customers who were basically just sitting at tables and using their laptop computers. We stayed for about half an hour, and in that time I think only one person actually got up and left. While there we thought about what else we could do, and decided to visit Stella’s bakery in North Beach, after it had been recommended to us by our waiter at Nick’s Lighthouse restaurant. We planned a route involving catching a 49 bus north to Union Street, then a 45 east to Columbus Avenue, where we thought the bakery was. The first trip was a long one, punctuated by a woman at the back screaming and telling other people to stop talking to her, and the bus driver threatening to stop the bus and call the police. Eventually we made it though and then we had to figure out where on Columbus Avenue the bakery was. At first we walked north, but turned around after we exhausted the length of street we’d walked down before, because we knew it was somewhere we’d passed already. Heading south we thought the area didn’t look right, but eventually we spotted the sign “Stella’s”, and it was right next door to Calzone’s restaurant where we’d eaten last week! We went in and looked at the various Italian biscuits and cakes, and bought a couple of pieces of almond biscotti and a chocolate dipped shortbread finger. They were all nice. We walked back to our hotel down Stockton Street, through the heart of Chinatown which we’d only seem from the bus before. It was an incredible feast of sights and smells, as we passed dozens of Chinese grocery stores and places selling dried fish and mushrooms, and others selling unidentifiable dried things for Chinese medicines. Several of the places were labelled in Chinese script only, with no English signage at all. Just before the Stockton Tunnel we saw a small procession of people, about a dozen ranging from children to one very old man with a long beard, dressed in colourful Chinese robes and playing small drums and bells, walking along the street and stopping to poke their noses into shops they passed and shout out some sort of greeting – possibly Happy New Year since the Chinese New Year was just a week or so ago. At the tunnel we climbed the steps up to the street above, then walked up the hill to the top, then crossed over to Powell Street for the remainder of the walk back to our hotel. 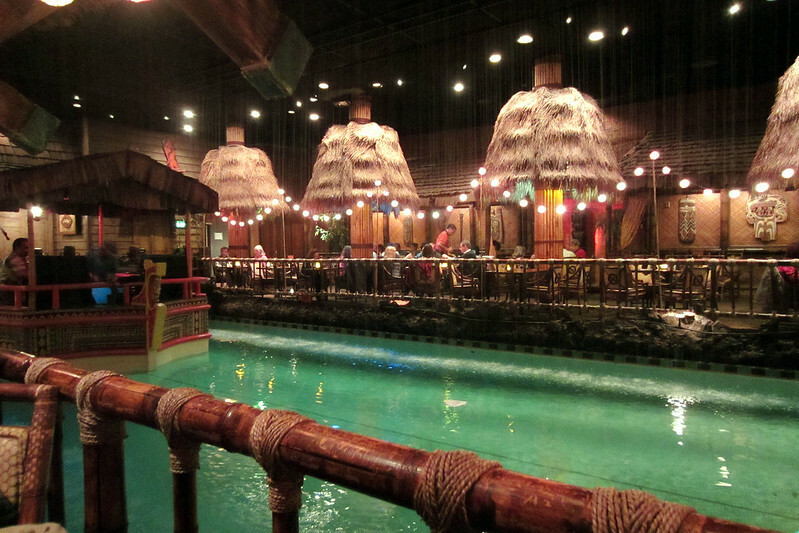 We rested for a short while and changed for our dinner appointment at the Tonga Room in the Fairmont Hotel. This was a hike up the steep hill all the way to the top of California Street, where the hotel is situated. On the way out we confirmed with our hotel reception that we had booked a late checkout for 16:00 tomorrow. Once there, we entered the main foyer and found a map showing the way to the Tonga Room, down two floors. The room is an old swimming pool which has been converted into a South Pacific themed restaurant, with tables surrounding the pool which still exists in the middle. At periods throughout the evening, simulated thunder and lightning play while rain gushes from the ceiling above the pool, making it sound like a tropical storm. A boat with a grass thatched roof floats on the pool, berthing at one end to allow a three piece band to step aboard, then drifting out to the middle as they play. We ordered some cocktails first, M. getting a zombie, while I got a mai tai. I was slightly disappointed that the mai tai came in a coconut shaped ceramic mug, and not a real coconut, but the drink was good. For food we ordered some shiitake egg rolls for an appetiser. These came with what the waiter said was called “Tonga sauce”, a combination of soy, mustard, and molasses. It was thick and brown and slightly sweet, and very different from any other sauce I’ve ever had with spring rolls. For mains M. got the kung pao with tofu, while I chose the Tonga hot pot, a combination of “Hawaiian seafood” in a spicy coconut curry sauce. With these we got the “forbidden rice mix” a blend of four different types of rice, resulting a black and brown combination with a delicious nutty flavour. The food was all very good. We ate slowly to savour the evening and the music and give us time to get through our cocktails. I got a glass of Sauvignon Blanc to go with my fish, while later M. ordered a pineapple royale cocktail, which was served in a whole hollowed out pineapple. For dessert I had the dessert sampler, which had a small coconut pudding with crunchy nuts and a blue sauce, two bite sized caramel tarts with something marshmallows on top, and three different flavours of mochi ice cream: green tea, coconut, and mango. After eating we got up to dance a bit to the band. There was an older couple doing some slower dancing as well. We didn’t leave until after 22:00, by which time we’d been there over three and a half hours. Several tables around has had people arrive after we arrived, who then left, were replaced by a new group of people, and who had also left! But we were having fun on our last night in San Francisco, so we didn’t care. When we finally left we walked back down the hill to our hotel and virtually dropped straight into bed. We hopped up when the alarm rang at 07:30 this morning, ate breakfast, and dressed for a day of walking. The day was dry, with some patchy cloud and blue sky, perfect for a long walk. 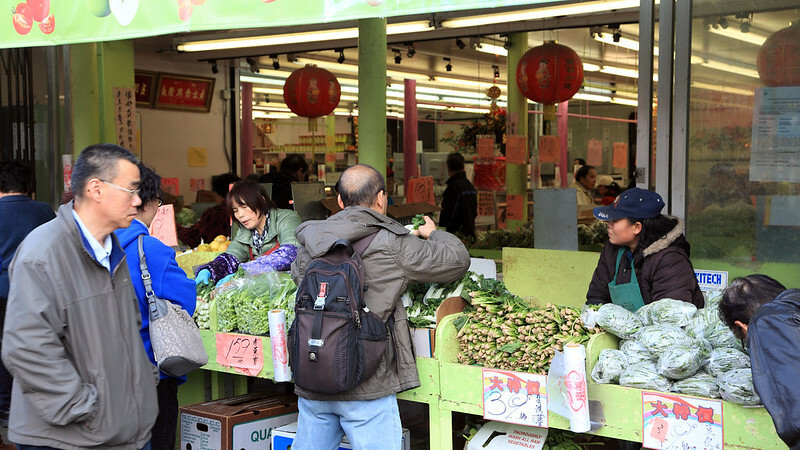 We hopped on a 45 bus at Stockton Street, taking it out to the Cow Hollow shops again. Here M. got a take away coffee from the Coffee Roasters cafe where we’d stopped the other day and drank it as we walked north the few blocks to Lombard Street to pick up a 28 bus out to the Golden Gate Bridge. One arrived shortly after and we got on. However, it continued along Lombard Street into the Presidio instead of turning onto the freeway out to the bridge, so I asked the driver if the bus was stopping at the bridge. He said we wanted a regular 28 bus, this one was a 28 limited stops! He let us off at the next stop and told us to take a 43 back to Lombard Street and get the regular 28 from there. We did so, and that backtrack and waiting time took us about ten extra minute, but soon we were on a normal 28 bus heading out the Golden Gate toll plaza and visitor centre. 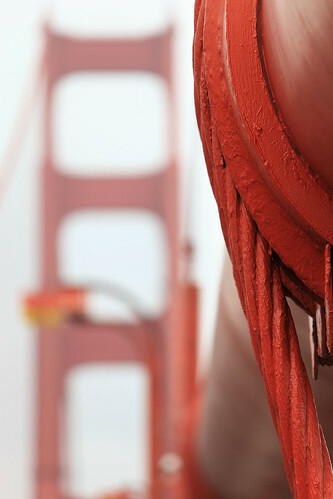 Golden Gate Bridge from the visitor centre. The bus dropped us off in front of a visitor centre and souvenir shop. We had a quick look inside and took some photos from the lookout towards the bridge, then proceeded up the steps on to the shared pedestrian and bicycle path on the east side of the bridge. We beg and the walk at 09:30 precisely and took almost an hour to reach the other side, stopping several times for photos and to enjoy the view along the way. The weather was dry, but there was a low cloud hanging over the bridge, just touching the tops of the towers, and a mist over the bay making the city skyline hazy in the distance, but visible. 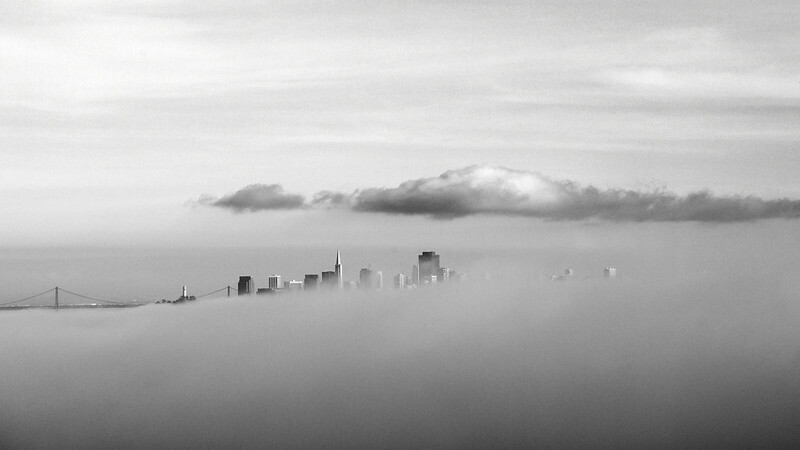 We could also see Alcatraz and Angel Island through the mist. The path was separated from the traffic only by a narrow fence, and it was quite loud the whole way across, except for where the path dodged outwards around the two towers which afforded some insulation from the noise. There was a fence running from near the toll plaza to the small concrete tower on the landward side of the first main tower, and I thought there would be a fence all the way across, to prevent people climbing over the railing and potentially jumping off, but after the concrete there was no fence at all. The railing was sturdy and chest high, but it would have been trivial for someone to climb over it and jump off the bridge. 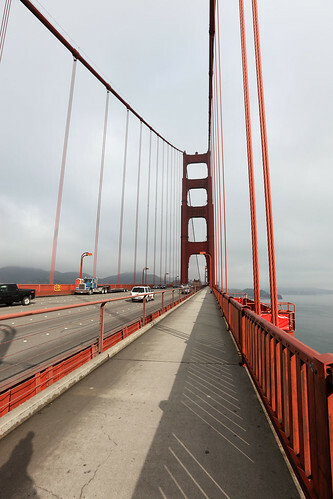 Walking across the Golden Gate Bridge. There were a few other walkers out on the bridge, as well as dozens of joggers and cyclists who passed us in both directions. Near the middle of the bridge two pedestrians were staring down into the water below, so we stopped and looked, and saw dolphins or porpoises playing in the water. Later searching revealed they were most likely harbour porpoises. At the northern end of the bridge we stopped at Vista Point for a quick photo. This is the same place our wine tour bus stopped yesterday, but this time the weather was much clearer and we could see the city reasonably well, though there was still a bit of low cloud and mist hanging around the bridge. From there we walked the short distance to the Alexander Avenue exit of the freeway and took this road down to Sausalito. There was no footpath by the road, so we had to walk on the roadway, staying outside the white painted line that indicated the traffic lane. We chose to walk on the left, facing any oncoming traffic, rather than have it come up behind us. It was lucky we did so, because cyclists were using this area as well, and it would have been bad to have them tearing down the hill, racing up behind us as they did so. The oncoming cyclists were struggling up the hill and so a much less dangerous proposition. We thought it was really weird that there wasn’t a pedestrian path, but I guess that’s America and their car future for you. Maybe it never occurred to anyone that people might want to walk down this road. 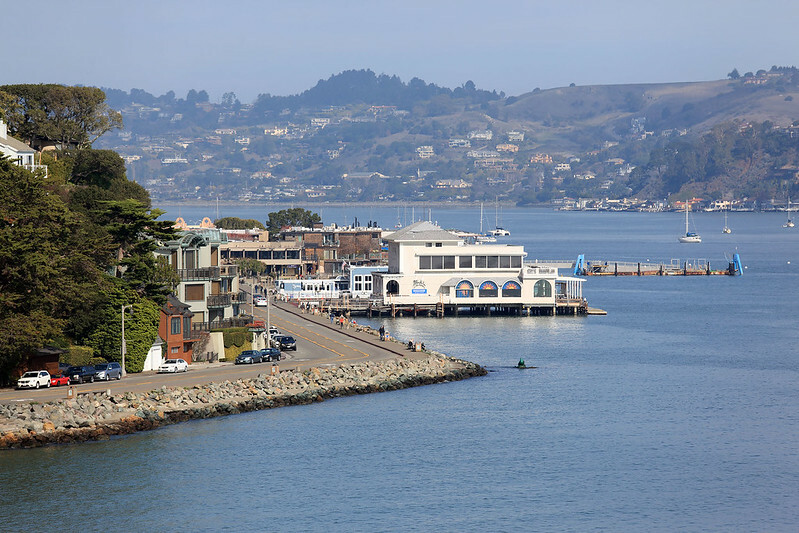 View of Sausalito from the approach road. Anyway, we reached the outskirts of Sausalito about 11:10, and then took another twenty minutes walking along the footpath that appeared there to reach the water and the first shops and cafes along the waterfront. By now the sun was out and we were getting hot from the walking, so took off our coats. It really was a beautiful day, especially compared to the rain and icy chill of the past several days. We looked in various shops as we walked along the main street. It was full of boutique fashion shops, art galleries, jewellery shops, and similar things, mixed with some restaurants and a few cafes and cheaper souvenir shops. Mostly it was fairly fancy though, like a rich suburb, and the neat and large houses spilling down the hillside above gave that impression too. Overall it was slightly reminiscent of Positano’s steep seaside hill covered in buildings. One shop I looked in had lots of scrimshaw and other nautical arty stuff like model ships and prints of sailing vessels. On a stand in the middle was a large chunk of woolly mammoth tusk, polished and for sale for only $11,000. Another shop had lots of prints of black and white photos of old movie and sports stars and scenery from various places, all no more recent than about the 1950s. We went into a sweets shop, where the woman behind the counter sounded relieved to have anyone walk in. I presume business must have been bad the past few rainy days. We bought a selection of taffy in various flavours. After a while we found a cafe for lunch. 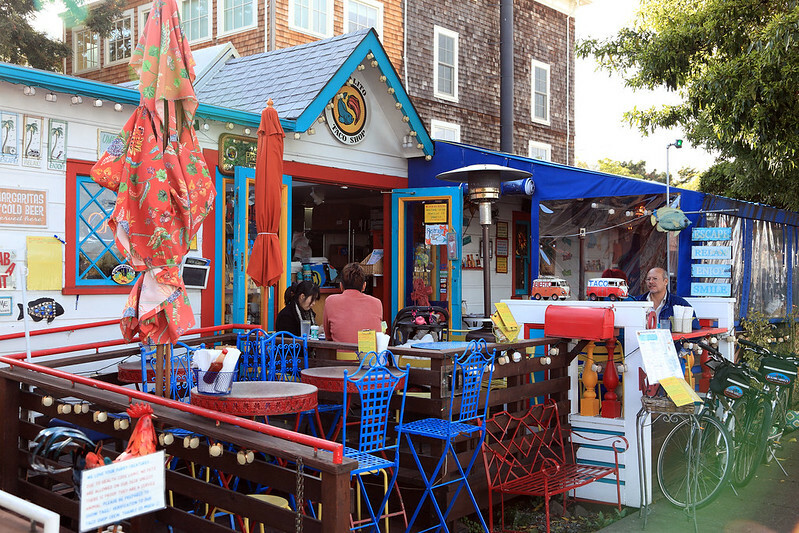 They had an eclectic collection of ethnic dishes plus some American staples. M. had a grilled cheese sandwich while I tried a “chicken kabob”. It came deconstructed on a plate with the grilled chicken pieces on a salad of lettuce and tomato and yoghurt, with pita bread on the side. I assembled some into a wrap and topped it with hot sauce. The chicken was good, and there was a substantial amount, meaning I had to eat the remainder with a fork after the bread was gone. Following lunch we continued walking north along the main street, which split into a couple of parallel streets for a few blocks. Here we found a jewellery store run by a woman, Katya, who made fused glass stones and set them in hand made silver and gold pieces. M. liked a bracelet which came with three stones of different sizes. The sample had light blue glass, but M. preferred a darker blue. Katya said she could make one up for us, it would take a week to make. When we said we were flying home soon she said she could ship it to us. So M. and I picked out some dark blue glass stones from trays of stones in a rainbow of colours and assembled them to test how they went together. We said it could be M.’s early birthday present, and made arrangements to have the item custom made and then shipped to us. We continued strolling around, taking a walk along the boardwalk and looking at all the expensive yachts and cruisers moored in the marina. We checked the ferry terminal to make sure we knew where to go and how to get tickets for later, then continued to the last few galleries and shops. 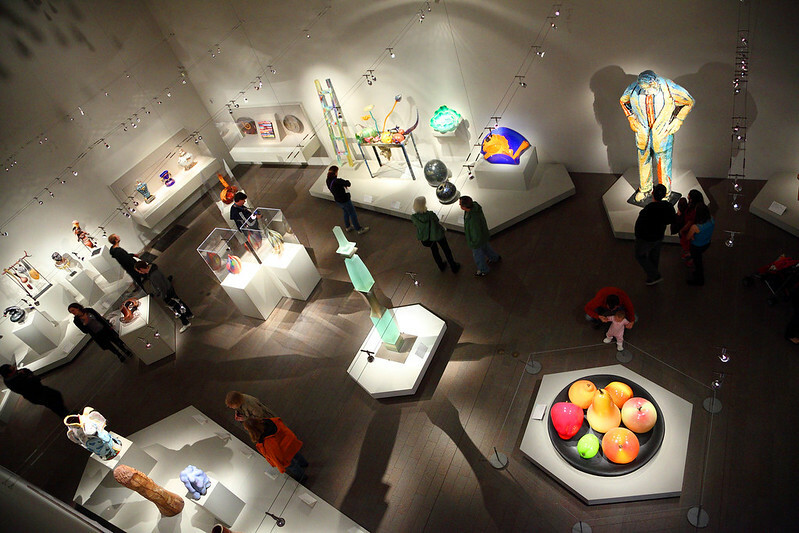 We looked into one gallery that had a lot of stuff we liked, including bronze frog sculptures that were glazed with various semi-lifelike colours, some colourful, almost cubist paintings, some artworks by Dr Seuss, and some amazingly lifelike glass jellyfish suspended in solid glass. There were also graceful bronze sculptures of ballet dancers, one life size and two maquette sized, and a collection of colourful bronze animals, decorated with a strange mixture of colours and symbols. M. liked these but I thought they were a bit too busy. 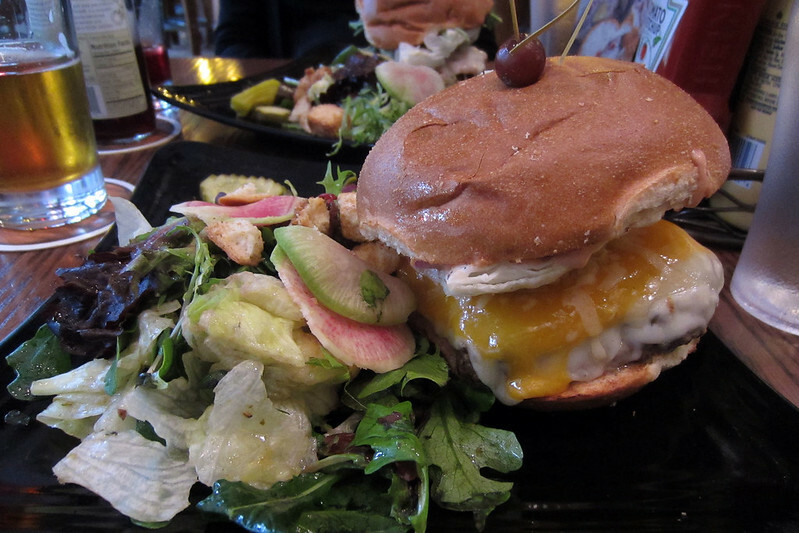 Special cheese burger, Napa Valley Burger Company, Sausalito. About 16:30 we entered the Napa Valley Burger Company restaurant to have a drink before having dinner there. I ordered a local red ale and M. got a Pinot Noir soft drink, which was essentially carbonated grape juice. At 17:00 we were hungry enough to order dinner. M. got the veggie burger while I chose the special cheese burger, which came with four different types of cheese on it. 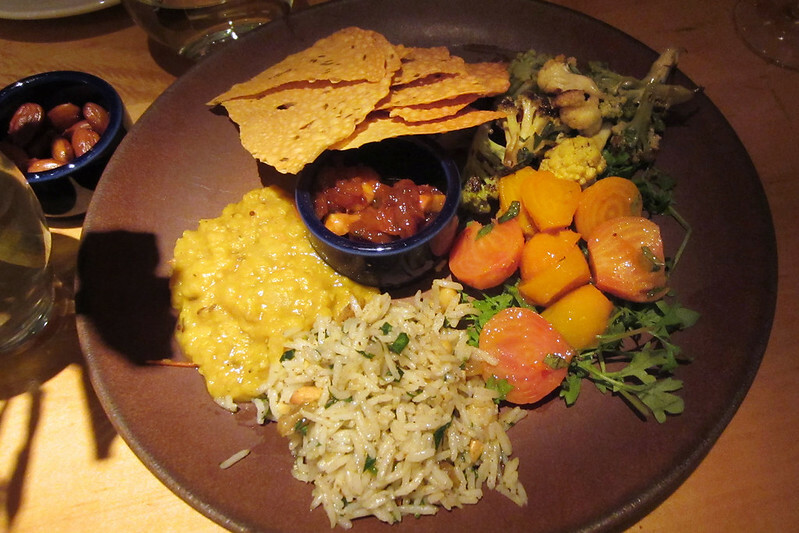 Each came with a salad on the side, which included some dill pickle slices and a pickled yellow chilli pepper. The burgers were both good and filling enough that we were very glad we hadn’t ordered any fries or other sides. We left about 17:45, intending to get the 18:10 ferry back to San Francisco. By now the sun had set and the sky was turning pink and purple, making the evening very pretty. We took a few photos then headed over to the ferry wharf to buy tickets. After that we joined the short queue of people waiting on the “no bicycles” queue, next to the much longer queue of people who had bicycles. The ferry pulled in on time and disgorged a large number of passengers, presumably mostly commuters coming home from work in the city. We boarded and climbed to the topmost of the three decks to get a spot in the open air at the back to enjoy the views. 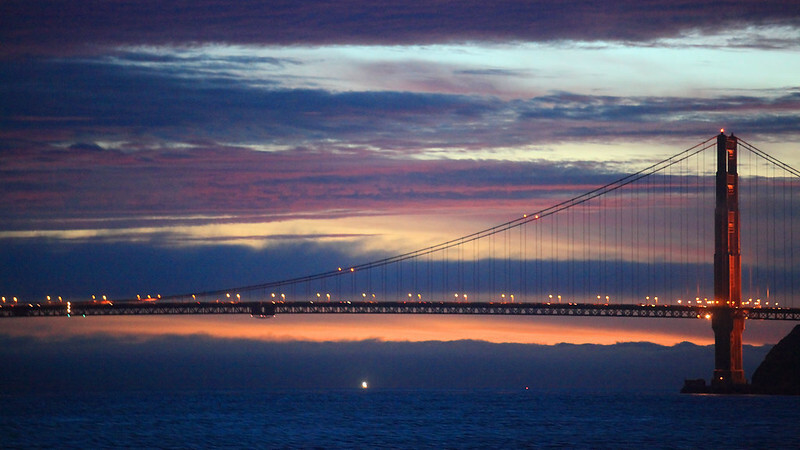 The trip was chilly with the wind of the ferry’s motion, but beautiful in the deepening twilight with the lights of Sausalito, the Golden Gate Bridge, and San Francisco framing the bay around us. The ferry passed close by the far side of Alcatraz, giving us a good view of the night-lit island and old prison building. After half an hour on the water. We pulled into the Ferry Building terminal and disembarked. We walked up Market Street and Sutter Street back to our hotel, where we took advantage of the relatively early evening to relax a bit. 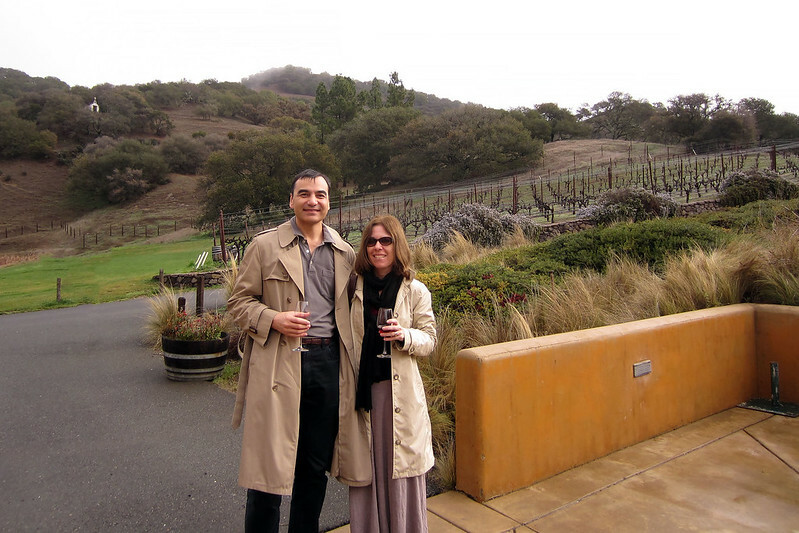 We spent today on a bus tour of the Sonoma and Napa Valley wine regions, and just got back to our hotel a while ago. We got up at 07:30 because we needed to have breakfast and be dressed and ready in the lobby at 08:10. We made it right on time, and had time to withdraw a bit of extra cash before a driver arrived to pick us up. A light rain was sprinkling outside, but it looked like it might clear up. The bus dropped us off at the Greyline tour company office near Fisherman’s Wharf, where we paid for the tour we’d booked and then went out to board a different bus. We climbed into the seat directly behind the driver, where we had a good view out the front windows. The driver went to check how many were in our tour group, and returned with one straggler, making a total of 22 passengers in the bus. We stopped briefly at Vista Point on the north side of the bridge for a view, but the fog was thick over the bridge, so Gordy herded us back on to the bus fairly quickly and continued the drive north and over east into Sonoma. As we entered wine country, Gordy turned the topic of his commentary to the ways and means of growing grapes, talking about the annual process of growth and harvesting and trimming back. He pointed out the hibernating vines on the hillsides, saying this was the time when they cut back the stalks to about three inches in length. He noted some were longer, because the growers elected to cut them back in stages, first to about nine inches, then a later cutting back to three inches. Wine tasting at Nicholson Ranch. The first winery we stopped at was a place called Nicholson Ranch. It was halfway up a small hillside and the place next door had an alpaca in a pen right nearby. There was a large pond out the back with water running down the hill in a small waterfall into it. The lady in the winery told us the waterfall had only started running for the first time in a year a couple of days ago, with all the recent rain. They let us taste three of their wines: an unwooded Chardonnay, an oaked Chardonnay, and then a Pinot Noir. The unwooded was the nicest of the three, with a slightly unusual flavour I don’t recall having in a Chardonnay before. They had a reserve red of some sort for sale at $50 a bottle, but not offered for tasting, which displeased one of the ladies on the tour with us. She wanted to know how she was supposed to know if she wanted to buy any if they wouldn’t let her taste it. We wandered up the hill a little, getting a view of the vines and a bit of the valley, though the view was spoiled a bit by the busy road cutting through it. After leaving here, we travelled across to the parallel Napa Valley, where we stopped at our second winery, Madonna Estate. 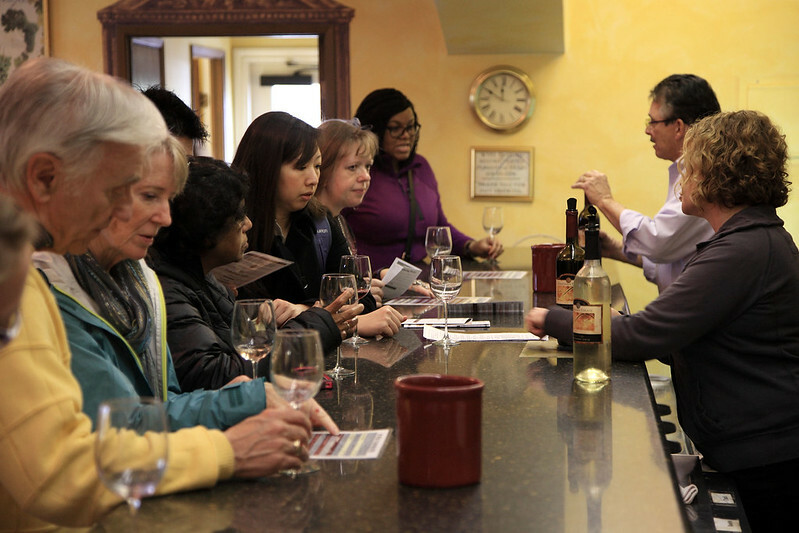 Here the staff were more eager to have us taste wines, and offered nine or ten different varieties. We didn’t try them all, but selected ones that sounded interesting to us. The Pinot Noir here was nicer and they had an interesting Cabernet Sauvignon with some hints of grassiness reminiscent of a Sauvignon Blanc. They also had a Gewürztraminer which I had to try; it was okay, but I’ve had better. I tried a couple of others, including a slightly sweet moscato, as well. I might have considered buying something, but they said that unfortunately they didn’t ship overseas, so it was moot. Wine tasting at Madonna Estate. The next stop was the small town of Yountville for lunch. This was a very pretty looking town, which seemed to have been built for day trippers from San Francisco, with lots of restaurants, boutiques, and arty shops. Lunch was at everyone’s own discretion, and our group scattered in different directions. We got lunch from the Bouchon bakery. M. had a lemon and poppy seed scone and a small brioche with salt on it, while I had a tuna nicoise sandwich on a ciabatta roll. We ate sitting in the open courtyard by the bakery, and the weather was pleasant enough that I took my coat off and just had my short sleeved polo shirt. After eating we took a quick look at some of the shops housed in a picturesque old two storey wine cellaring building. One was a chocolate shop called Kollar Chocolates, which had exquisite looking hand made chocolates as well as a selection of gelati. I wanted to try the chocolate and the lemon cookie gelati, but was wary of mixing them. The woman behind the counter said the lemon cookie was “wild” and recommended it, and M. said I should just mix lemon and chocolate. So I got a small cup with a bit of both flavours, and both of them were really good. M. bought some boxes of the chocolates for her parents and brother. Then we went upstairs and browsed around. I looked in a photography place which had large frames prints of photos of vineyards and other local scenery. Some of them were amazingly beautiful. M. had me try on a hat, of the flat cap style. 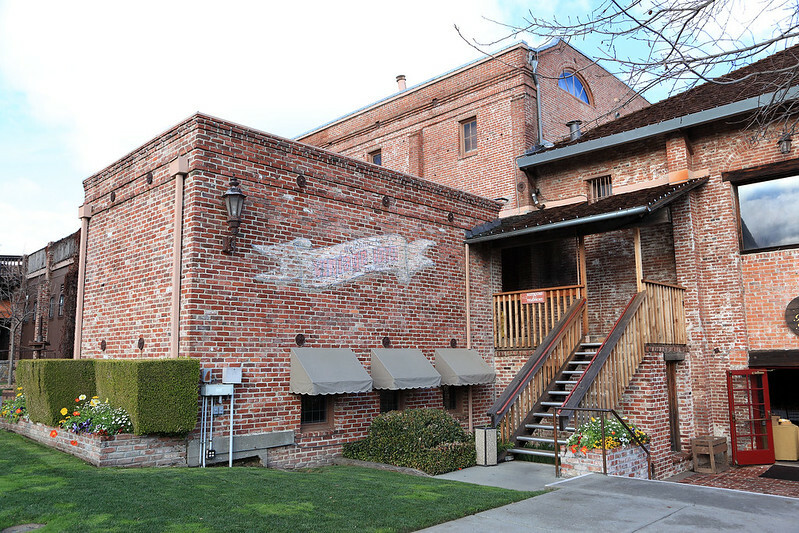 Old wine cellaring building turned into shops, Yountville. We used the toilets there and then went back to the bus to rejoin the rest of our group. We had a bit of a wait as Gordy rounded up a straggler, who was a woman who we’d learnt had come to San Francisco from somewhere near Philadelphia for a horror film festival. She had said that she was into action and adventure, bungee jumping, zip-lining, rock climbing and so on. But we were soon on our way to the third and final winery. This was Sutter Home, which Gordy told us was one of the biggest wineries in California and owned several brands and labels. The tasting room was next door to a lovely old wooden home with a huge tulip magnolia tree out the front in full flower, making it pretty as a picture. Here we tried their white Zinfandel, which is actually a pink colour, making it technically a rosé wine. It was very nice. Then we tried a red Zinfandel, and then a slightly sweet white, possibly a moscato. After the woman had given us these and explained a bit about them, she ushered us all into the main bar area where we could try five other varieties of wine they made, which included a couple of dry styles, a Gewürztraminer, a bubbly pink Moscato which was very sweet, and a port. Altogether we had the impression that these wines were sweeter in general, and Gordy commented that Sutter Home became popular because they made sweeter wines that appealed to Americans with limited experience with wines. M. and I agreed the best wines of the day were at Madonna Estate. By now we were two hours from San Francisco and it was about 15:00, so it was a non-stop trip back to the city to drop us off at our respective hotels. Gordy dropped the bungee woman near but not exactly right in front of her hotel and she said, “Oh! Are you leaving me here? 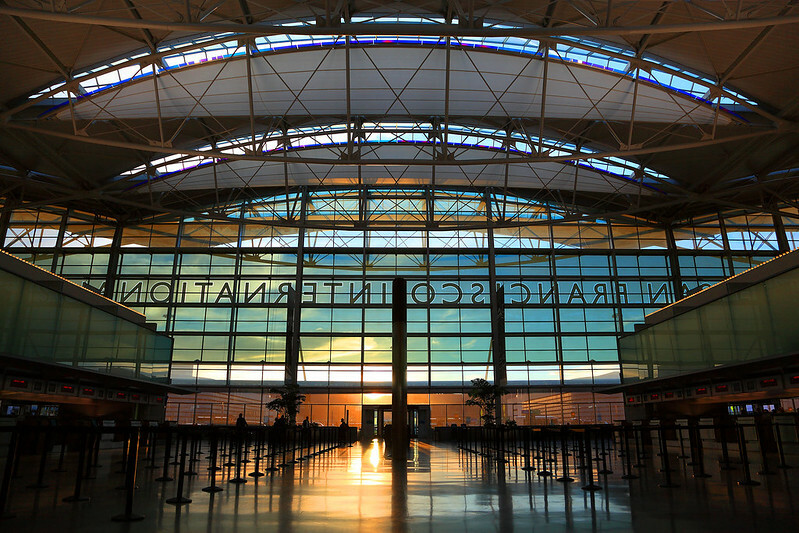 !” When she’d disembarked, Gordy commented that she did bungee jumping and jumping out of planes and stuff, but she didn’t want to walk six car lengths to her hotel. Gordy dropped us at the corner of Sutter and Powell, just a short walk from our hotel. The drive back to San Francisco. We rested for a while, then went out a bit after 18:00 for dinner. We walked down to the King of Thai Noodle House, since we’d enjoyed the dinner there a week ago. We got a table right away, near the front door this time. M. ordered a pad thai, while I opted for the chicken and pumpkin curry. We also got a serve of egg rolls. The whole lot came at once. The curry was delicious and quite hot with chilies while the pad thai was made with thinner noodles than at home and had a slightly different taste, but was still recognisably similar. On the way home we stopped at Walgreens to get more milk and Grape Nuts for breakfasts, hopefully enough to last us until we leave. I also wanted to get a tub of Ben & Jerry’s Chunky Monkey ice cream, but they didn’t have any of that flavour. So we dropped the food off in our room and went out again to the other Walgreens on our own block and found it there. We took it back to our room for dessert while we relaxed into the evening before bed time. I think the hotel is on to us. After a week of taking two or three apples a day from the reception counter, they’ve stopped putting a bowl of apples out there. We woke up lazily this morning, only being ready to leave by about 09:30, when the cleaner came around and knocked on our door just before we were ready to go for the day. We stopped in at Bar Norcini, an Italian-ish style coffee bar in the foyer of a hotel down Powell Street, so M. could get a coffee. After that we braved the rain once again and caught a 38 bus west along Geary Street to the Richmond district. There we changed to the 44 bus south to Golden Gate Park, but only after stopping in at the Cafe Coco on the corner where the bus stops were to buy some bagels for lunch. The staff seemed confused by what we wanted to order, and eventually gave us four bagels, toasted and spread with a thin layer of cream cheese. This was close enough, so we went to catch the next bus. When the bus arrived at Golden Gate Park, it dodged around the roadblock set up to stop traffic entering the park (I presume this is a thing they do every Sunday). In the park was a huge number of people. At first I thought it was a protest or rally or something, but it turned out to be a queue to get into the Academy of Sciences! The bus driver said it was a free entry day today, and he could drop us here at the back of the queue if we wanted, instead of driving all the way to the museum and the bus stop there. We said no, we were going to the de Young Art Museum, and a lady on the bus said that would be fine, as they weren’t having a free day today. The queue was astounding. It snaked a good three or four hundred metres, unsheltered from the rain, with about half the people huddled under umbrellas. This queue made the one at the Exploratorium last Sunday look tiny. 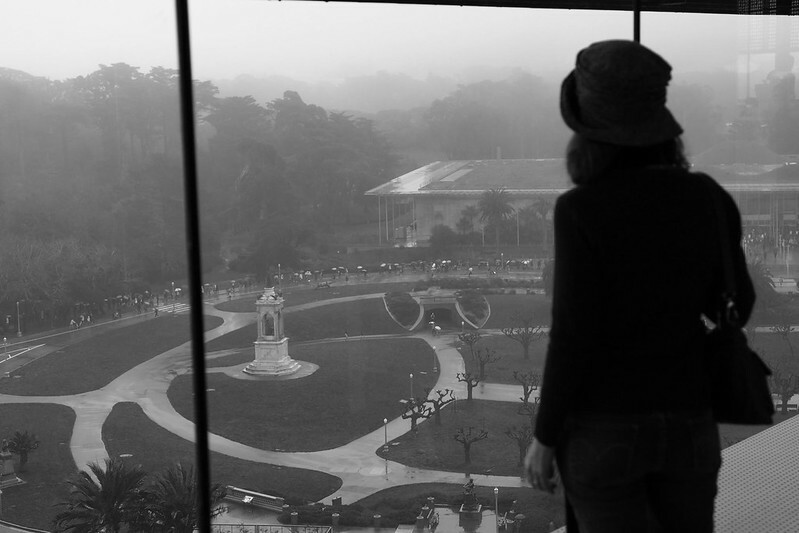 Looking at the queue for the Academy of Sciences, from the observation tower of the de Young Museum. The bus let us off right in front of the de Young Art Museum, and we scurried to the nearest likely entry point, which looked like it would be around the far side of the attached cafe. However a security guy ushered us into the cafe through a door and did a bag check on us, then let us proceed through the cafe to the museum entry hall beyond. We paid $8 each for entry to the permanent exhibits (which included a $2 discount for taking the bus there), but declined to pay extra for the temporary Bulgari art exhibit. We went downstairs to leave our coats and umbrellas in the coat room, and also left the bags with our bagels. Back up to the ground floor, we started with the Native American Art section, which had exhibits of Mayan and Aztec works, including a room full of fragments of wall murals from Teotihuacan, and lots of pottery and ceramic sculptures. There was also some Olmec and a bit of Inca stuff, and a few things from other Mesoamerican and South American cultures. There was also a substantial section of Eskimo and Inuit art, much of it carvings of walrus tusks or whale bones, as well as some wood. From here we transitioned to modern American art, with various contemporary sculptures, abstract works, and so on. There was a room dedicated to the building of the Bay Bridge, with archival photos of the construction process, as well as artistic lithographs of scenes of the bridge under construction, and architectural drawings. This section done, the time was a bit after midday and we felt like lunch, so we returned to collect our bagels from the cloak room, then sat to eat one each. We decided then to move to the cafe to eat the second one, in case we weren’t supposed to be eating there, but the cafe had a sign outside saying “no external food”. So we stood outside the cafe doors and ate our second bagels, then went inside and got some cups of water to wash them down. Back in the museum proper, we ascended a level and started on the American paintings section. This began with works around the 17th century, mostly portraiture. It progressed through landscapes and still lifes, following the progression of European art. There were a few sculptures as well, and a selection of antique furniture and furnishings to show off the developing American styles. This section concluded with American impressionist works and the beginnings of abstraction. There were also other galleries full of native art from Africa, Oceania, and Asia, but we decided to skip these and spend the rest of the afternoon over at the Conservatory of Flowers, a short walk away through the park. We collected our belongings from the cloak room and walked through the misting rain to this old exhibition style building, that looks like it is made form white rattan from the outside. We paid $8 each to enter and found ourselves in a tropical wetland, warm and humid and lush with greenery. We had to remove our coats and I also took off my jumper. Scattered amongst the foliage were dozens of orchids and other tropical flowers, in a wide variety of colours and shapes. We progressed around the building anticlockwise, entering another section where they kept highland tropical plants, and where the temperature was much cooler. Another section contained aquatic plants, with a large pond filled with lilies, rice plants, and other things. They had a model of a giant Queen Victoria Lily from the Amazon, which you could walk under to see the structures on the underside of the giant leaf, but there wasn’t a real one visible in the pond. 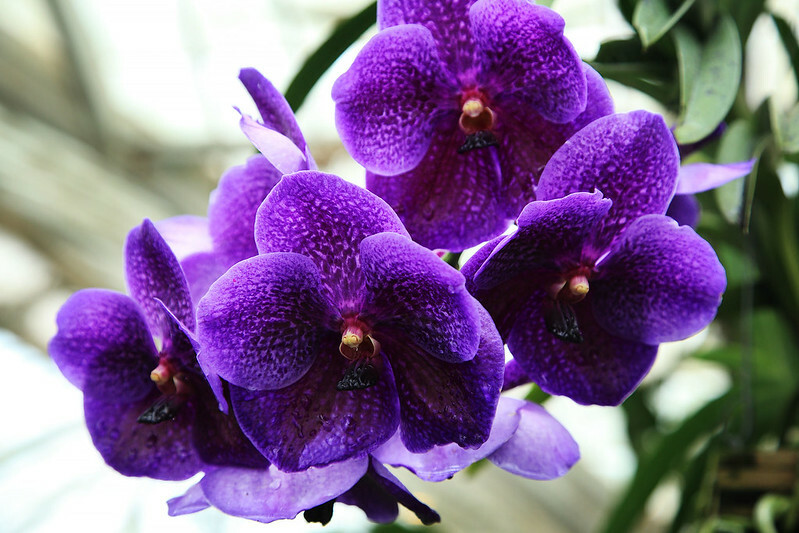 Orchids in the Conservatory of Flowers. Back through the lowland section and across to the other end of the long building, there was a room full of live butterflies. This was very cool, although it seemed to have only about five or six different species that I could distinguish. We checked we weren’t carrying any butterfly hitch-hikers as we left the room and finished our circuit of the conservatory. Then we exited and walked back to the bus stop at 8th Street, right outside the park. A bus approached as we were waiting to cross the road to get to the stop, and we managed to wave it down as the light changed and get on board. We rode back to the intersection with Geary Street and changed buses on to a 38 heading back towards Union Square. We got there just before 16:00 and decided to see if we could get a table at the Cheesecake Factory for an afternoon tea. Bbt the wait for a table was still about 45 minutes. Instead, I got a slice of the carrot cake cheesecake to take away, and we went down to the Starbucks on level four, where M. got a mocha coffee and we sat at a window table, looking through the huge Dior banner out on to Union Square. The cheesecake was really more carrot cakey, but that was fine by me and it was delicious. After that we headed back to our hotel room. We showered and changed into nice clothes for dinner. While M. was finishing up, I went downstairs to the lobby to book a winery tour of Napa Valley for tomorrow. We are taking an eight hour tour, which will pick us up from the hotel lobby about 08:10 in the morning. That done, we left our room to wait outside the hotel for Lisa and Rick to pick us up in their red Mini and take us to the dinner booked at Greens Restaurant. They arrived on time and we piled into the small car for the trip north to the old military wharves where the restaurant was located. Mary was already there waiting for us, but Casey had begged out because of coming down with a migraine today. The restaurant was moderately large and full of diners. Panoramic windows faced west towards the Golden Gate Bridge, which we could barely see glowing with lights through the foggy night. On a clear day at sunset, it would be a gorgeous view. and artisan cheese plate with Bellwether Farm San Andreas cheese, Andante Dairy Rondo cheese and Piccolo cheese, quince paste, Marcona almonds, and warm Italian bread. For the main course, I chose the butternut squash and sweet potato gratin with poblano chilies, grilled onions, smoked cheddar and fromage blanc custard, served with tomatillo sauce, cashew cream, grilled polenta and rainbow chard with pumpkin seeds. M. picked the goat cheese ravioli with savoy spinach, kale, spring onions, almonds, brown butter, pecorino fiore sardo, and crisp sage leaves. We also shared a bottle of Planet Oregon Pinot Noir with everyone, which was light and very transparent red, but full flavoured and complex for a Pinot. It was all really good. For dessert I had the banana cake, which came with a banana and coconut sorbet and chocolate sauce, also very good. Over the meal we chatted about all sorts of things and had a great time, but eventually we had to leave. We split the bill, and it was lucky we’d remembered to get some cash just before going out, because we needed most of what we’d withdrawn so far to cover it. We said goodbye to Mary in the car park and then Rick and Lisa drove us back to our hotel and dropped us off. It was a lovely evening out, with good food and company, and a very nice way to finish off our Sunday.